Writerly types, rejoice! 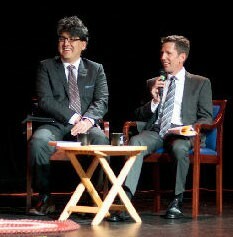 Your favorite Spokane sons, Sherman Alexie and Jess Walter, have started a podcast where they read excerpts from things they're working on, talk about writing and interview guests. It's called "A Tiny Sense of Accomplishment" and you can find it here or embedded below. The discussions offer insight into how Alexie and Walter work, plus glimpses at unpublished works. But they're also conversational and wide-ranging enough to sound like you're just eavesdropping on friends. Enjoy!